What Would Susan B. Anthony Say to Trump? Despite having lived in Rochester for the past four years, I’ve never made a formal visit to the gravesite of Susan B. Anthony prior to November 8. That day marked the first election I voted in, and the first election in which America might elect its first female president. It seemed like the perfect time to honor the suffragette for her work nearly 100 years ago. 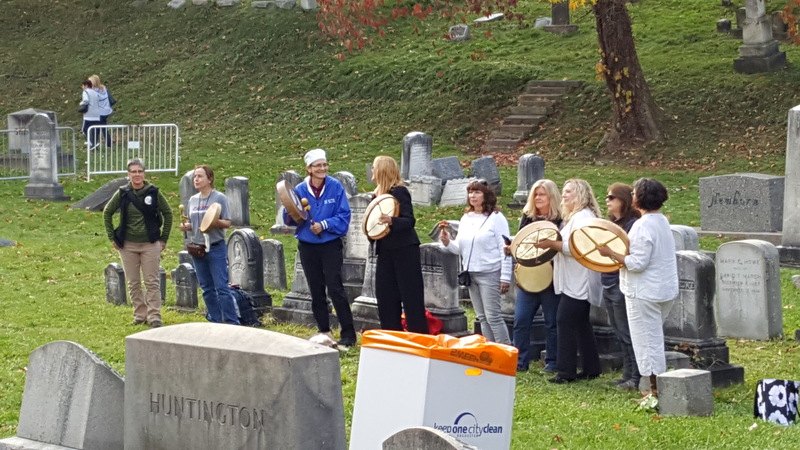 I wasn’t alone in my desire to thank Susan B. Anthony – hundreds of others gathered there to pay respects. In short, it was a beautiful event. People of all ages and genders formed a line nearly a mile long. My friend and I waited for more than an hour with our fellow feminists and believers in equal rights. Several women chose to come dressed in white pantsuits, a nod to the suffragists from many years ago and Hillary Clinton. Others carried signs and banners with messages like, “Love Trumps Hate” and “I’m with her.” I remember smiling at a little girl wearing a sequined red, white and blue skirt thinking this was the kind of thing I’d want to bring my future daughter to. We even got to meet and shake hands with Lovely Warren, the first female mayor of Rochester. 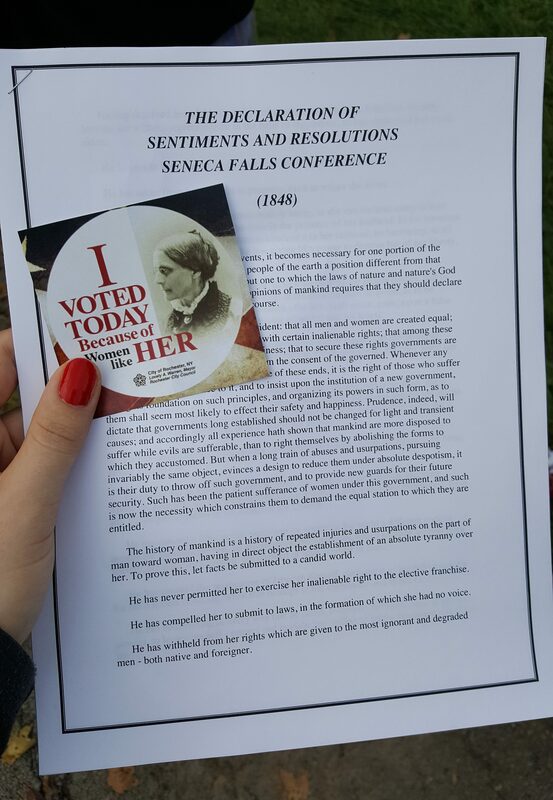 By the time we reached the actual gravesite, the energy of the crowd, combined with the powerful words from the Declaration of Sentiments reading, made me feel an incredible sense of pride. We, as women, have come so far since Susan B. Anthony’s time, and I am extremely grateful for that because I know I wouldn’t be where I am today without women like her refusing to give up. 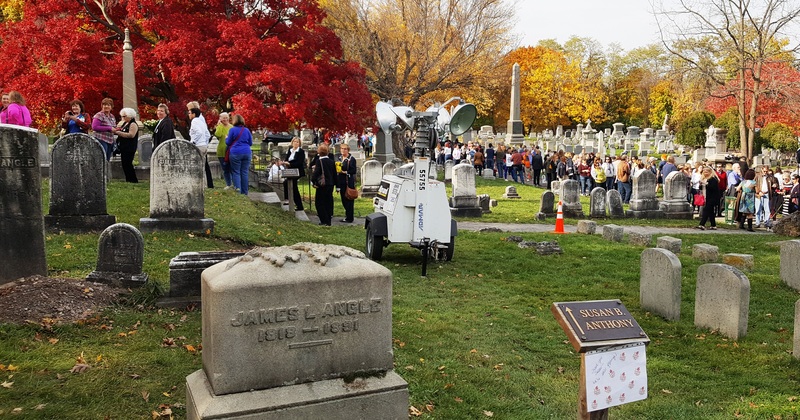 Her gravesite was adorned with flowers, cards and “I voted” stickers. It was a wonderful sight. That morning was full of laughter and smiles. I wish I could say the same about the following day. In one word, the following morning was difficult. When I first heard the news that Donald Trump was to be our next president, I thought back to the previous day. I remembered the handwritten note I saw by Anthony’s gravesite that read, “We’re still fighting!” and I wondered if all that fighting is really getting us anywhere. I felt a lot of things at that moment. I felt like we had suddenly been thrown back hundreds of years. I felt disheartened and naive because I had hoped for a better future. And most of all, I felt scared. I was scared for my friends and family, for the many international students I knew and for the future of our country. Susan B. Anthony never stopped fighting and I believe Hillary Clinton won’t either. It is because of strong women like them that I find the strength to continue the fight. Students on my campus have already started to organize their own fights and I will stand with them because, as Susan B. Anthony once said, “No man is good enough to govern any woman without her consent;” and Donald Trump is not my president.